Mumble.fr Review 2019: Is Mumble.fr a Good Hosting? Mumble.fr is a hosting company that provides an open source voice chat application with customizable in-game overlay, voice detection, application skins, and conversation recording. Though their app can be used for any group activity, it’s intended for gamers. Part of the Trust Telecom SARL, Mumble.fr provides low latency servers that let you host a community of gamers online. Members enjoy premium voice communication and real time support via chat. Their servers are monitored round the clock. What I like about Mumble.fr is that server setup is instant. 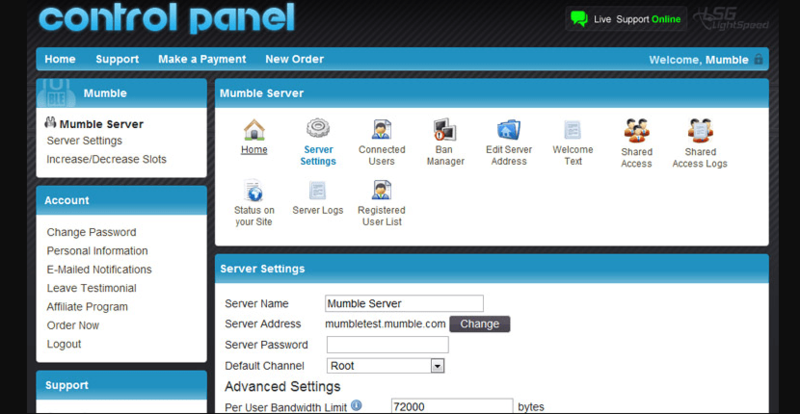 Simply create an account, load it with credit, and then order the Mumble pack that suits you best. They offer three options with Super Access and a varying number of slots. Server delivery takes less than one minute, and you don’t need to wait for their administrators to install or configure it. Using JSON, you can also display server channels and all connected users on your website. Once your server is up and running, you can proceed to create a custom hostname for your gaming community. It’s simple as adding a prefix to mumble.fr. It could be avidgamersguild.mumble.com or any other name. If you’d like your friends to connect to your server quickly, go for a short and memorable hostname. Mumble.fr’s server control panel gives you advanced permissions and full control over the privileges of users. From the dashboard you can view connected users, update the welcome text, kick out users, update server settings, make a payment, and even place a new order. The best part is that you can personalize client settings, specifically the interface, transmission, audio processing, and compression quality. Mumble.fr offers you three billing cycles; monthly, semi-annually, and annually – all with an easy cancellation option. They accept payments via American Express, echeck, Discover, MasterCard, VISA, and PayPal. When you order three months or more, you get 25% off of your initial payment. They don’t have any hidden fees. If you’re not satisfied with their hosting service, you can cancel your plan within 30-days and get a full refund. Users can only contact Mumble.fr customer support via their online messaging form. It would be nice if they had phone support and live chat service. That notwithstanding, they do monitor their servers 24/7, which allows their network engineers to rectify server overload before it becomes a nuisance. I encourage you to check out their forum index which has tutorials and tips and a forum for general discussions. You can also reach out to their support from their forum. If you’re looking for low-cost servers to host and connect with your gaming friends in France or beyond, give Mumble.fr some consideration. Wondering how Mumble.fr stacks up against other Web Hosting companies? Enter any other Web Hosting company and we will give you a side-by-side comparison.